Inspired by a friend who makes Suzetta Williams Baby Vest Garter Ridges for charity all the time, her granddaughter, a teenager, wanted one for herself. She searched for weeks and could not find the exact pattern she wanted. 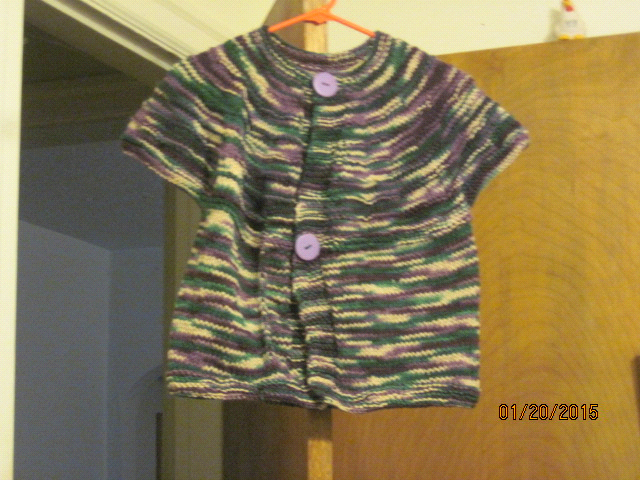 In a conversation we wanted to give it a try, so we contacted Suzie and I set out to create this sweater. Her granddaughter loved it. I would like to thank Suzie and Erin for their inspiration and Erin for testing the pattern. I hope others enjoy it also. I have written in several options that can be made as you go along such as 1 or 2 buttons, and different lengths. I would suggest you read the pattern carefully before starting. Note: For a large button, work row 4 as follows, K2, BO 3, K to the end of the row. NOTE: For waist length sweater stop at Row 120, then 7 rows of knit. For a mid hip length, work 150 rows, then 7 rows of knit, and for lower thigh length work 180 rows, then 7 rows of knit.